"Changing of the guards" redirects here. For the song by Bob Dylan, see Changing of the Guards. Not to be confused with Sovereign's Bodyguard. The Queen's Guard and Queen's Life Guard are mounted at the royal residences that come under the operating area of the British Army's London District, which is responsible for the administration of the Household Division. This covers Buckingham Palace, St James's Palace and the Tower of London, as well as Windsor Castle. The Queen's Guard is also mounted at the sovereign's other official residence, the Palace of Holyroodhouse, but not as often as in London. In Edinburgh, the guard is the responsibility of the resident infantry battalion at Redford Barracks. It is not mounted at the Queen's private residences at Sandringham or Balmoral. The Queen's Guard is the name given to the contingent of infantry responsible for guarding Buckingham Palace and St James's Palace (including Clarence House) in London. The guard is made up of a company of soldiers from a single regiment, which is split in two, providing a detachment for Buckingham Palace and a detachment for St James's Palace. Because the Sovereign's official residence is still St James's, the guard commander (called the captain of the guard) is based there, as are the regiment's colours. When the Sovereign is in residence, the Queen's Guard numbers three officers and forty other ranks, with four sentries each posted at Buckingham Palace (on the forecourt) and St James's Palace (two in Friary Court, two at the entrance to Clarence House). This reduces to three officers and 31 ORs, with two sentries each, when the Sovereign is not in residence. The Queen's Guard is not purely ceremonial in nature. They provide sentries during the day and night, and during the later hours, they patrol the grounds of the Palace. Until 1959, the sentries at Buckingham Palace were stationed outside the fence. This stopped following an incident involving a female tourist and a Coldstream Guardsman – due to the continued pestering by tourists and sightseers, the guardsman kicked the tourist on the ankle as he marched. The tourist made a complaint to the police and the sentry was confined to barracks for ten days. Not long after, the sentries were moved inside the fence. At any time, three infantry battalions are posted for public duties; two of these are Guards battalions (one based at Wellington Barracks next to Buckingham Palace and one at Victoria Barracks in Windsor), while the third is a line infantry unit (based at the Royal Artillery Barracks, Woolwich). In addition, there are three incremental companies based at the Royal Artillery Barracks and Wellington Barracks. All of these units come under the administrative authority of London District — as public duties units, they not only take part in ceremonial but are also committed to providing military aid to the civilian authorities. However, in theory, any Commonwealth unit can provide the guard. On many occasions, the Gurkhas, RAF Regiment and Royal Marines have provided the guard, while a handful of units from other Commonwealth countries have also done so (see below). Only one unit has come from a Commonwealth country of which the Queen is not head of state, namely the 1st Battalion, Royal Malay Regiment, in 2008. The RAF Regiment has a dedicated ceremonial unit, the Queen's Colour Squadron; this unit represents the RAF whenever it provides the Queen's Guard. In November 2017, the Royal Navy mounted the guard with a company-sized detachment formed of volunteers from 45 ships and shore establishments for two weeks, the first time that the Royal Navy had formed the Queen's Guard in its own right (rather than being represented by the Royal Marines). Since 2013, regular public duties responsibility has reverted to the Household Division. However, line infantry units occasionally provide the Guard for short periods of time. In the summer of 2018, Balaklava Company, the dedicated public duties unit of the Royal Regiment of Scotland, and 2nd Battalion, The Rifles, both provided the Guard at Buckingham Palace and Windsor Castle. In 1938, the Honourable Artillery Company, a Territorial Army unit, provided the King's Guard. The same regiment subsequently provided the Queen's Guard in 1958. During the 1990s, the Band of the Honourable Artillery Company provided musical support for the Queen's Guard, and they continue to do so in the 21st century. In June 2015, soldiers from the 3rd Battalion, Royal Welsh, provided the Tower of London detachment of the Queen's Guard. On 14 May 1941, the Home Guard provided the King's Guard, in recognition of the first anniversary of its foundation. This was repeated in May 1943. There are two detachments of the Queen's Guard in London, one each for Buckingham Palace and St James's Palace, under the command of the captain of the Queen's Guard. Because St James's Palace is still the official residence of the court, it is here that the colour is lodged and the captain of the guard establishes his headquarters. The Queen's Guard in London changes in the forecourt of Buckingham Palace at 11:00 am every day in the summer and four times per week in the winter. The St James's Palace detachment of the Queen's Guard, led usually by the corps of drums, and bearing the colour (if the Queen is in residence, then this will be the Queen's colour; if she is not, then it is the regimental colour), marches along the Mall to Buckingham Palace, where the Buckingham Palace detachment has formed up to await their arrival. These two detachments are the old guard. Meanwhile, the new guard is forming up and are awaiting inspection by the adjutant on the parade square at Wellington Barracks. The band, having been inspected by the adjutant, forms a circle to play music whilst the new guard is inspected. The guard provides a full military band consisting of no fewer than 35 musicians (usually, although not always, from one of the Guards regiments) led by their director of music. When the new guard is formed up, led by the band, it marches across into the forecourt of Buckingham Palace. Once there, the New Guard advances towards the old guard in slow time and halts. The old guard presents arms, followed by the new guard presenting arms. The captains of the guards march towards each other for the handing over of the palace keys. The new reliefs are marched to the guardrooms of Buckingham Palace and St James's Palace where new sentries are posted. During this time the band has taken its place by the centre gate, formed up in a half-circle, where it plays music to entertain the new and old guard as well as the watching crowds. During this period, the two regimental colours are paraded up and down by the ensigns (usually junior officers of second lieutenant rank or equivalent). With the old and new guards formed up once again, the old guard and the band march out through the centre gates in slow time to their regimental slow march played by the band. At the end of the slow march, the captain of the old guard gives the word of command to 'break into quick time' and with a brisk five pace roll from the drums, the band leads the way back to Wellington Barracks. A detachment of the regiment on guard at Buckingham Palace and St James's Palace is also responsible for providing the guard at the Tower of London. As the Tower is still officially a royal residence and is also the location of the crown jewels, it remains the Army's obligation to guard it. The Tower guard numbers one officer, three NCOs and ten soldiers, and usually posts a sentry outside the Jewel House and one outside the Queen's House. As the protection of the Tower is their responsibility (in conjunction with the Yeoman Warders), the guard must also see it is secure at night (see Ceremony of the Keys). One of the public duties battalions or incremental companies is responsible for providing the guard at Windsor Castle. The location of the ceremony at Windsor varies; in the Easter, when the Queen is in residence it usually takes place on the lawn in the castle's quadrangle. In wet weather or winter, to protect the lawn, or when the Queen is not holding court at Windsor Castle, the ceremony occurs outside the guardroom by Henry VIII's Gateway at the foot of Castle Hill. The ceremony for changing the Windsor Guard is broadly the same as that which takes place at Buckingham Palace. At 10.40am, the new guard marches from Victoria Barracks, through Windsor and turns left, going up Castle Hill to enter the Lower Ward. During the Easter, and when the Queen is holding court at the castle, the guards change in the Upper Ward on the grass. When changing guard in the normal way, the new guard arrives at roughly 11 am when the old guard has formed up outside the guardroom. Once both guards and the duty band (there is no duty band on Sundays) are present, the old guard and new guard will present arms to each other, interspersed by bugle calls – the officers will then go towards each other and symbolically touch left hands to 'hand over the keys to the castle' (though no actual keys are handed over anymore). The guards will then slope arms and the reliefs will be formed up to go round the castle and change the sentries – during this process, the band typically plays a selection of music. Once the relief returns, the old guard forms back up ready to march back to Victoria Barracks. The band leads them out whilst the new guard presents arms. Once the old guard has left, the new guard is dismissed to the guardroom where they will be based for the next 24/48 hours – every two hours, the guard relief will march out and change the sentries. With a guard mount at 3 pm, each guard consisted of one officer, one sergeant, one corporal, one lance corporal, eight guardsmen and a drummer; originally the guard had thirty guardsmen. Once at the bank, there were two sentry posts, one outside the Counting House Parlour and another outside the bullion vaults. The officer was given half a bottle of port and the right to invite a friend or two to dinner in the bank. The other ranks were given a pint of beer with their dinner and one brand new shilling, two for a sergeant, to buy tea and a cake in the canteen. The Guard wore plimsolls in the Bank. From 1963, the Bank Picquet travelled by vehicle clad in service dress and armed with automatic weapons, with the emphasis on security moving from ceremonial to tactical deployment. Improved security features and armed police made the guard unnecessary, and the service ended on the evening of 31 July 1973. The Guard is also mounted in Edinburgh at the Palace of Holyroodhouse, the Queen's official residence in Scotland, and at Edinburgh Castle. Unlike in London, there is no Guards battalion permanently based in the city, so the Guard is provided by whichever the resident infantry battalion is at Redford Barracks in the city. The guard is not mounted throughout the year – it is usually mounted daily during the week that the Queen spends at the palace (prior to her summer break at Balmoral), and during the Lord Commissioner's Week. Until 2001, sentries were permanently posted on the Esplanade at the entrance of the castle, ostensibly as the guards to the Honours of Scotland housed inside. The sentries were changed every hour. 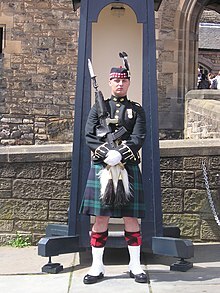 However, cutbacks in the size of the army led to the permanent castle guard being abolished – now, the guard is mounted at the same time as the guard at the Palace, or when there is a royal visitor to Edinburgh. Sentries are also posted during the month of the Edinburgh Military Tattoo, usually from a unit that has an anniversary that year. As part of the reorganisation of the infantry following the 2003 defence review, the 1st and 2nd Battalions, Royal Regiment of Scotland (the Royal Scots Borderers and Royal Highland Fusiliers) were permanently based in Edinburgh, rotating between 19 Light Brigade or 52 Infantry Brigade. Whichever battalion is assigned to 52 Brigade was responsible for performing public duties in Edinburgh. As part of the 2010 defence review, announcements of further reforms to the infantry led to the reduction of the 5th Battalion, Royal Regiment of Scotland to an incremental company, similar to the three companies of foot guards stationed in London, which is now public duties unit permanently based in Scotland. The Queen's Guard is an operational posting, with the primary purpose of protecting the Sovereign. However, there have been a handful of incidents over the years when this protection has been tested; in 1982, a man named Michael Fagan was able to evade the sentries stationed in the grounds of Buckingham Palace and make his way to the Queen's bedroom, before he was captured by police. In this instance, security of the Queen's room was the task of the Metropolitan Police. In 2004, a member of the pressure group Fathers4Justice spent five and a half hours standing on the parapet by the balcony at the front of Buckingham Palace. Again, the security was the primary responsibility of the Metropolitan Police; although the Queen was not present at the time, it raised fears of the possibility of a terrorist attack on the palace, and gave rise to calls for the British Army to be given a greater hand in the overall security of the Royal Family. A sentry will be on duty "at their post" for a two-hour period. Every 10 minutes, he comes to attention, slopes arms and does a march of 15 paces across the area of the post. Each sentry will do this four to five times before halting. He will then shoulder arms and stand at ease. Standing "easy" is not permitted whilst a sentry is at post. Orders for sentry duty read out before each 2 hour 'tour of duty', make it clear to each individual that: "you may not eat, sleep, smoke, stand easy, sit or lie down during your tour of duty". Sentries receive instruction on how to eliminate nuisance or any suggestion of threat from members of the public. There is a protocol they follow which begins with "stamping" (coming to attention sharply). He will also shout: "Stand back from the Queen's Guard" or similar. If this does not eliminate the nuisance or threat he will repeat the stamp and shout again. If the nuisance or threat still does not cease the sentry will assume the position of "port arms" whereby he points his rifle at the source of the interference with his duties. If these warnings are not heeded the sentry then has the choice of detaining the person(s) himself or pressing the button in his sentry box to summon assistance. Although formerly the guards were able to be positioned among the public, in recent times, more and more of the sentry posts have been moved away from the public because of incidents involving tourists interfering with the guards' job. Most recently, ropes were installed between the sentry posts at Windsor Castle and the public after an incident occurred between a sentry and a tourist who was mocking him, pretending to march alongside him and eventually grabbing the shoulder on which his rifle was resting. In London, the only open sentry posts remaining not usually behind any sort of fence were those at the Pall Mall entrance to St James's Palace (although when the Prince of Wales took up residence at Clarence House, the sentries were moved outside the gate); however, in December 2014, the Pall Mall sentries were moved to Friary Court inside the walls of the palace, while the Clarence House sentries repositioned inside the fence and at the entrance to the gardens. This was as a result of the increased threat of so-called "lone wolf" terrorist attacks, particularly following the murder of a British soldier in Woolwich, and the terrorist attack on the Canadian Parliament. Battalions on public duties were part of the regular arms plot, a system where infantry battalions were periodically rotated to various locations and different roles. Following the restructuring of the army announced in 2006, the arms plot system ceased – infantry battalions have now been given fixed roles and locations. In theory, this includes public duties in London, which will retain its two guards and one line infantry battalion. However, for some postings, including public duties, light role infantry battalions will continue to rotate. In the case of public duties in London, the four Guards battalions will rotate every two years, while the line infantry battalion will rotate with battalions assigned to 52 Infantry Brigade and British Forces Cyprus. This has changed following the implementation of the Army 2020 plan. In April 2007, the first serving women in the British Army served on detachments of the Queen's Guard when the King's Troop, Royal Horse Artillery, took over the guard at Windsor Castle, while the Army Air Corps took on public duties in London. This was not the first occasion that women have provided the Queen's Guard. In 2000, the Australian Federation Guard performed public duties in London for a month and included several women amongst its number. Female officers were also among the contingent of Royal Canadian Mounted Police members who formed the guard in May 2012. The first female captain of the Queen's Guard was 24-year-old Captain Megan Couto of the 2nd Battalion, Princess Patricia's Canadian Light Infantry, which formed the Queen's Guard in June 2017 in celebration of Canada 150. The following is a list of units from the British Empire and Commonwealth to have mounted the King's Guard/Queen's Guard. The Queen's Life Guard is the mounted guard at the entrance to Horse Guards. Horse Guards is the official main entrance to both St James's Palace and Buckingham Palace (a tradition that stems from the time when the Mall was closed at both ends); however, sentries have been posted there since the Restoration, when the Palace of Whitehall was the main royal residence. The guard is on horseback from 10 am until 4 pm, with the two sentries changing every hour. From 4 pm until 8 pm a pair of dismounted sentries remain. At 8 pm, the gates of Horse Guards are locked, and a single sentry remains until 7 am. When The Queen is in London, the Guard consists of one officer, one corporal major (who carries the standard), two non-commissioned officers, one trumpeter and eleven troopers. This is known as a "long guard". When the Queen is not resident in London, the Guard is reduced to two non-commissioned officers and ten troopers. This is known as a "short guard". The guard is usually provided by the Household Cavalry Mounted Regiment, with the Life Guards and the Blues and Royals alternating. When the HCMR leaves London for a month of summer training (and vacation for the horses), the guard is provided by the King's Troop, Royal Horse Artillery. Only two other regiments have mounted the Queen's Life Guard: in 2000, the Mounted Troop of Lord Strathcona's Horse (Royal Canadians), a regiment of the Royal Canadian Armoured Corps, mounted the Queen's Life Guard during the same deployment as The Royal Canadian Regiment provided the Queen's Guard. In 2012, as part of the Queen's Diamond Jubilee celebrations, the Musical Ride of the Royal Canadian Mounted Police mounted the Queen's Life Guard for a day in May 2012, becoming the first non-military unit to do so. At the time of guard changing, the old guard forms up on the north side of the enclosure on Horse Guards Parade and the new guard on the south side. As the new guard arrives, each guard carries the standard and the trumpeters of both old and new guards sound the royal salute on the arrival of the new guard and on the departure of the old guard. When both guards have formed up in the enclosure, the corporal major, senior NCO and sentries of the first relief of the new guard leave for the guard room, which is then handed over. The sentries of the old guard, after being relieved, rejoin the remainder of the old guard on the north side of the enclosure. The standard and trumpeters are only on parade with a long guard. ^ "Buckingham Palace guard slips in front of tourists". The Daily Telegraph. 14 April 2015. Retrieved 23 August 2016. ^ "Royal Navy declared ready to mount historic first public duties". Royal Navy. 24 November 2017. ^ "A first time honour for the Royal Navy". Royal Navy. 17 November 2017. Retrieved 18 November 2017. ^ In August 2007, the Worcestershire and Sherwood Foresters Regiment were amalgamated with the 22nd (Cheshire) Regiment and the Staffordshire Regiment to form the new Mercian Regiment. While stationed in London, 1WFR was renamed as 2MERCIAN. ^ a b "2 PWRR soldiers step down from ceremonial duties – News stories – GOV.UK". ^ "The Royal Regiment of Scotland passed fit for London public duties". British Army. 20 April 2018. Retrieved 16 June 2018. ^ "Public Duties in London and Windsor - May and Jun 2018". Household Division. Archived from the original on 16 June 2018. Retrieved 5 May 2018. ^ "band of the honourable artillery company changing of the guard 18/10/201". YouTube. Retrieved 24 September 2018. ^ "The Argus (Melbourne, Victoria) – Thursday 15 May 1941 - HOME GUARD ON DUTY AT PALACE - Trove". nla.gov.au. 15 May 1941. Retrieved 24 September 2018. ^ "Getty Images – ITN Source – NATION SALUTES HOME GUARD". itnsource.com. Retrieved 24 September 2018. ^ "Events | The British Army – The Queen's Guard". army.mod.uk. Retrieved 24 September 2018. ^ "Lessons from Ukraine: what if WE lost patience with politicians?". ^ Forrest Capie. The Bank of England: 1950s to 1979. p. 64. ^ At the last performance of the 2011 Tattoo, the Guard of Honour was formed by the High Constables of Edinburgh, who celebrated their 400th anniversary in 2011. ^ a b c "Changing of the Guard at Buckingham Palace". ^ "Queen's Guard turns rifle on a tourist at Windsor Castle". The Telegraph. 27 June 2015. Retrieved 29 June 2015. ^ Taher, Abul; Nicol, Mark (27 December 2014). "Retreating of the Queen's Guard: End of an era as palace sentries fall back in face of mounting fears of new 'lone wolf' terrorist attack". Mail Online. Daily Mail. Retrieved 24 September 2015. ^ "Queen's guards moved behind fence over security threat". Royal Central. 6 December 2014. Retrieved 24 September 2015. ^ "Mounties guard the Queen in London for a day". CTV. 23 May 2012. Archived from the original on 25 May 2012. Retrieved 25 May 2012. ^ Jones, Toby (26 June 2017). "Buckingham Palace welcomes first female Captain of the Queen's Guard". The Independent. Retrieved 26 June 2017. ^ "BBC News | UK | Female soldiers guard the palace: Captain Cynthia Anderson led the Buckingham Palace detachment in the morning parade and formally asked permission for the new guard to relieve the old guard". news.bbc.co.uk. Retrieved 24 September 2018. ^ Pugliese, David (16 June 2017). "Canadian military units take on ceremonial duties as the Queen's Guard in London". ottawacitizen.com. Ottawa Citizen. Retrieved 18 June 2017. ^ "Public Duties". Royal Canadian Air Force. 12 June 2018. Archived from the original on 16 June 2018. Retrieved 17 June 2018. ^ Montgomery, Marc (19 October 2018). "Canadian troops once again guard Buckingham Palace". Radio Canada International. Canadian Broadcasting Corporation. Retrieved 18 November 2018. ^ "FORECAST OF CEREMONIAL AND MILITARY EVENTS IN LONDON AND WINDSOR" (PDF). FORECAST OF CEREMONIAL AND MILITARY EVENTS IN LONDON AND WINDSOR. British Army. Archived from the original (PDF) on 6 September 2012. Retrieved 21 March 2012. ^ "Canadian Mounties take over Royal duties at Horse Guards". Ministry of Defence. Retrieved 1 June 2012. ^ "Canadians on guard at Buckingham Palace | CBC News". cbc.ca. Retrieved 24 September 2018. ^ "Queen guarded by Canadian Mounties today". The Telegraph. 23 May 2012. Retrieved 25 May 2012.